Wheelhouse is more than just a business. We are extremely committed to being a part of our community in meaningful ways. Below, find out how we do that. If you are interested in partnering with Wheelhouse in any of the ways described, please reach out to info@wheelhousedetroit.com or use the submission form at the bottom of the page. One of our most important relationships is with Detroit City Football Club. We’ve been bleeding rouge and gold since 2012, DCFC’s inaugural season. At each and every home match at Keyworth Stadium, we provide complimentary bicycle valet to attendees. Season ticket holders receive 10% off any of our tuneup packages. And, we sell DCFC gear and tickets at our Hamtramck shop! Techno is one of Detroit’s most special creations, and we are proud to honor it with our annual participation in the venerable Movement Festival! We offer complimentary bicycle valet to festival-goers and we also host an annual Techno Bicycle Tour that visits, among other sites, the Packard Plant and Submerge HQ. In a sense, Wheelhouse was born from the Tour de Troit. Kelli started organizing the ride in 2005 and its rapid growth was part of what nudged her into opening the Wheelhouse in 2008! As such, you’ll find Wheelhouse crew at every TdT event in support mode. If you’ve ever had an issue at any of their events, odds are you’ve been helped out by someone from Wheelhouse! Wheelhouse wants everyone to experience the Motor City on two wheels…or three! We are very pleased to partner with Mogo Detroit Bike Share and PEAC to bring an array of adaptive bicycles to Detroit, including recumbent tricycles, upright cargo tricycles, hand tricycles, tandem bicycles, and tandem tricycles. Because of storage and maintenance needs, Mogo’s adaptive options are stored offsite, so reservations are required. Please visit Mogo’s site to learn more about the program, purchase a pass, and make a reservation. Fact: if you see bicycle infrastructure — including racks, repair stands, and air pumps — you know you are in a bicycle-friendly place. 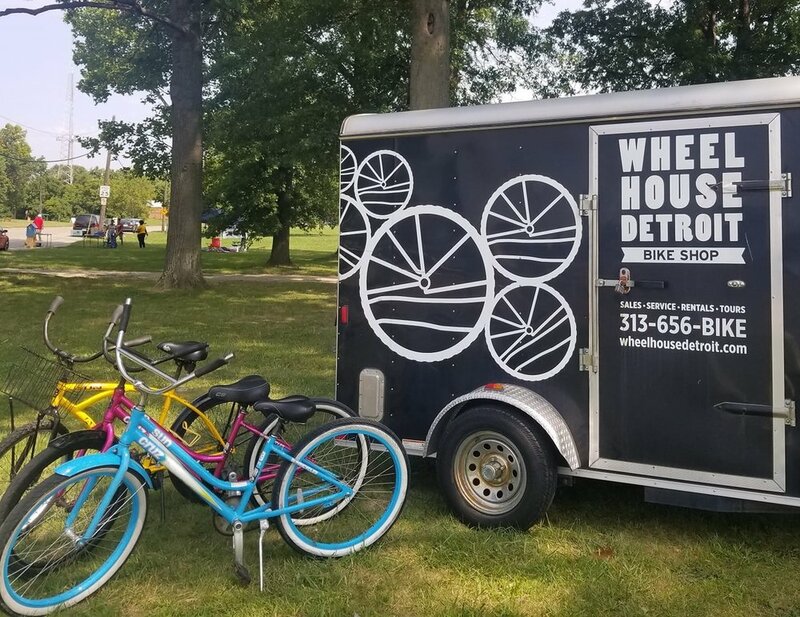 Wheelhouse works with local businesses, institutions, and municipalities to help make Detroit, Hamtramck, and Highland Park more hospitable to cyclists. We’ve partnered with the City of Hamtramck, Clark Park Coalition, Detroit RiverFront Conservancy, Bumbo’s, Detroit Yoga Lab, the Skillman Foundation, and numerous others to select, procure, and even install the goods! Wheelhouse can provide bicycle racks and staff to facilitate bicycle parking for an event of any size. Besides DCFC and Movement, we’ve worked with Crash Detroit, D-Electricity, Belle Isle Kite Festival, St. Patrick Senior Center, African-American World Festival, Wayne State University Baroudeur, Detroit Jazz Festival, Detroit Riverfront Conservancy, Hamtramck Labor Day Festival, and Detroit Bike to Work Day. Unique events and organizations lend themselves to creative partnerships! Event-specific bicycle rentals, ongoing tours that bring visibility and funds to organizations, bicycle part donations…we love supporting efforts to better our communities! Partners include Open Streets, Keep Growing Detroit, Ford Piquette Avenue Plant, Fort Wayne Coalition, Corktown Historical Society, J-Cycle, Back Alley Bikes, Wrench Detroit, and the Hamtramck Neighborhood Arts Festival. Wheelhouse is a small business that runs on a very tight margin, so we can’t often donate money to a cause, no matter how righteous it may be. But we have a couple of options if you are looking to raise funds. We throw a monthly First Friday Happy Hour at the Hamtramck shop, and each benefits a local charity. It’s a great way for us to introduce your constituents to our shop, and a fun way to raise some funds! We also donate tour spots to charity auctions. Note: Due to the sheer volume of requests, we do tend to limit gift certificates to non-profits located in the cities of Detroit, Hamtramck, and Highland Park. Interested in partnering with us? Email Us!